In November and December of 1943, U.S. President Franklin D. Roosevelt met with Chinese President Chiang Kai-shek and British Prime Minister Winston Churchill in Cairo, Egypt, to discuss the progress of the war against Japan and the future of Asia. In addition to discussions about logistics, they issued a press release that cemented China's status as one of the four allied Great Powers and agreed that territories taken from China by Japan, including Manchuria, Taiwan, and the Pescadores, would be returned to the control of the Republic of China after the conflict ended. During the spring and summer of 1943, President Roosevelt grew increasingly concerned about the status of the ongoing conflict in China. Morale was low and inflation high in China, leading to concerns that the country could give up its fight or fall to the continuous Japanese onslaught. Moreover, the leader of U.S. forces in the theater, General Joseph Stilwell, did not get along well with Chiang Kai-shek, and their personal conflicts seemed to foreshadow potential cracks in the alliance. Other problems, such as difficulties getting much-needed supplies through to General Claire Chennault, who was leading U.S. air forces in China, and the lack of a full-on air assault as promised by the U.S. Government also contributed to growing tensions. Roosevelt wanted positive, productive relations with China after the war, as well as Chinese assistance in keeping British, Russian, and Japanese expansion in Asia in check, so he proposed the Cairo conference as a means of expressing public confidence in the Republic of China. The conference itself was a stopover on the way to meet Soviet leader Joseph Stalin in Tehran, but the Roosevelt Administration gave the Chinese leader a symbolic boost by meeting with him privately before the conference began and before Churchill arrived. At the series of meetings in Cairo, Roosevelt outlined his vision for postwar Asia. He wanted to establish the Republic of China as one of his Four Policemen. This concept referred to a vision for a cooperative world order in which a dominant power in each major region would be responsible for keeping the peace there. Weak as the Republic of China would inevitably be after the war, it would still be the major power in Asia, and it could help prevent renewed Japanese expansionism and oversee decolonization under a trustee system. Roosevelt hoped to prevent the British and the Russians from using postwar instability to increase their presence in Asia, and he advocated for Indochina to be established as a trusteeship instead of returned to France after the Japanese defeat. To secure this future, he sought a commitment from Chiang Kai-shek that China would not try to expand across the continent or control decolonizing nations, and in return, he offered a guarantee that the territories stolen from China by Japan including Manchuria, the island of Taiwan and the Pescadores Islands would be returned to Chinese sovereignty. Roosevelt also sought and gained Chiang's support for his proposal to create a trusteeship for the colonial territories after the war; in the end, this idea failed to gain the support of the British or French and was not enacted. Although Roosevelt and Chiang had some shared interests and the same ultimate goal of victory in the Pacific in Cairo they also addressed some of the points upon which their strategies differed. Chiang had hoped for an offensive assault to reopen the Burma Road, which had been a major supply line to south China before being overrun by Japanese forces in 1942. Any operation to reopen the road was dependent on British cooperation as Burma was still a British colony, and the British proved reluctant to commit forces to the Bay of Bengal for the attack. Roosevelt shrewdly guessed that promises to aid China in reopening its supply lines were almost more important than the actual execution of the offensive, as it demonstrated the importance of the Republic of China to the United States Government. The idea was to boost sagging morale in China, and at the same time, make a public statement that even after the war's conclusion, the United States would remain committed to maintaining peace in the world. In the Cairo Declaration, jointly released by the United States, the Republic of China and Great Britain on December 1, 1943, the allies pledged to continue the war against Japan and to eject the Japanese forces from all the territories it had conquered, including the Chinese territories, Korea, and the Pacific Islands. 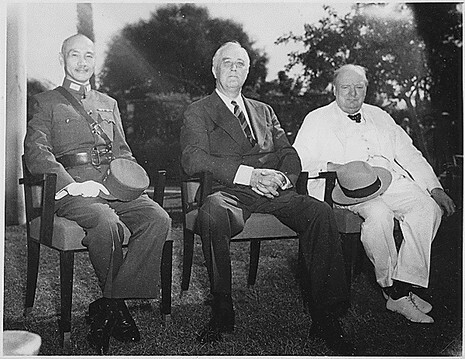 The Cairo Conference was attended by "The Big Three": President Franklin Roosevelt of the United States, Prime Minister Winston Churchill of the United Kingdom, and Generalissimo Chiang Kaishek of the Republic of China. Before the conference took place, intelligence leaked somewhere in Washington or London, and German field agents were assumed to be knowledgeable of the travel plans of Roosevelt and Churchill. Cairo was outside the jurisdiction of Dwight Eisenhower's control, but since Roosevelt would have to travel great distances through his sector, his recommendations were sought upon in this situation. Eisenhower recommended that the location to remain the same, for that a sudden change in meeting location (alternate locations include Malta, Khartoum, among others) would not give the military nor Secret Service enough time to prepare security details, and might become riskier. Roosevelt and Churchill agreed with Eisenhower, and the conference remained at the original location of Cairo.